Vision Billiards is committed to providing you with superior products as well as superior service. We prioritize your time and promptly respond to your needs and inquiries. Always feel free to call with questions. Our award-winning products are carefully constructed using premium materials from solid wood to professional cloth. Ours is a concierge service. We can assist throughout the process of choosing and owning your perfect Vision table. Our designer convertible pool tables are made in Europe from the finest raw materials. We offer dozens of styles to suit every taste. We specialize in convertible tables but also offer award-winning tables for playing traditional pool, Russian Pyramid, carom, snooker, poker, and table tennis. 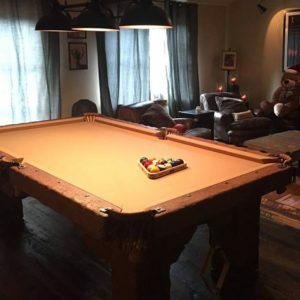 Distinct from our convertible and traditional lines, we offer a unique line of hand-crafted, exquisite rustic log pool tables perfect for mountain living. Vision Billiards is the American branch of 'Bilijardai', a European pool table manufacturer that has been manufacturing tables in Lithuania, Europe since 1994. Since then, we have been the leading innovators of convertible pool table design and construction. Each new billiard table design is manufactured and lab tested in Lithuania for durability over many months. We are constantly striving to remain at the top of our industry. 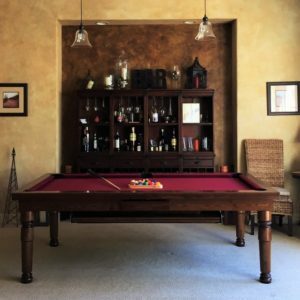 What also sets us apart is that we offer a unique blend of superb quality and variety in our tables, while maintaining the best prices on the market for high-end pool tables. Our convertible dining pool tables are constructed to be both stunning dining tables and serious billiard tables. Their careful construction consists of an assemblage of solid wood, metal, slate and professional cloth. We also offer an array of furniture, lighting, and accessories, as well as table options for Russian Pyramid, carom, snooker, pool, poker, and table tennis. 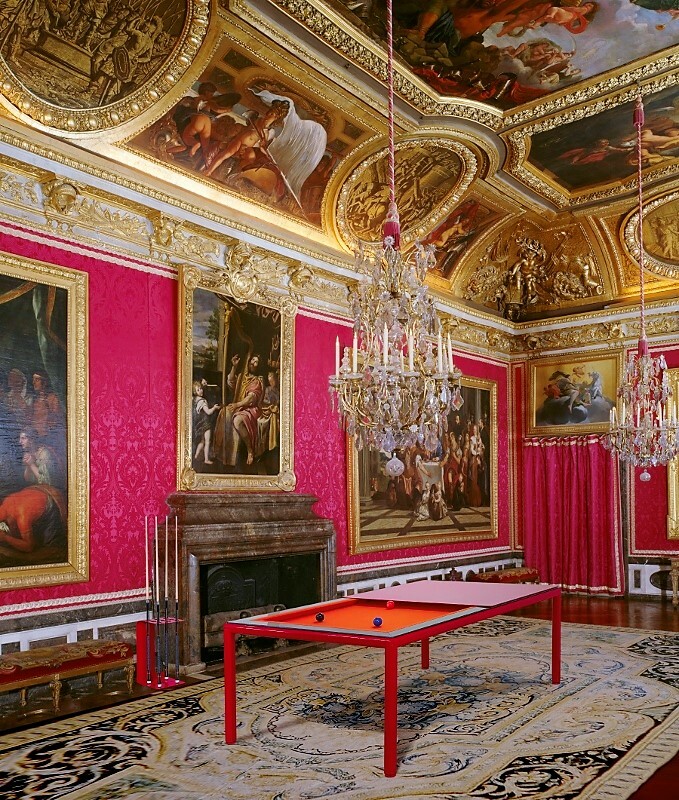 Our billiard tables have won multiple international design awards. They have been chosen as official game tables of international billiards tournaments. And they remain the best selling convertible dining pool table brand in Europe. Our tables are chosen by property owners, businesses, interior designers and professional pool players around the world. We are proud, a brilliant icon such as Sir Richard Branson himself owns one of our tables. You can learn more here. Our convertible dining pool tables can easily be converted from dining, desk, conference or multi-purpose work table to a game table. Watch below how simply our tables transform. If your own custom pool table is what you desire, we are happy to walk you through the process. Feel free to modify colors of existing designs or we offer bespoke tables that you can design from scratch using our online Table Builder tool and with our assistance should you need it. We revel in happy customer testimonials. Feel free to browse through customer tables in our Gallery and read more reviews on our Testimonials page. "I LOVE, LOVE, LOVE how my pool table turned out!!! The installers were amazing and did a wonderful job. It's always so nerve-wracking ordering a custom piece, but you made the process super easy and it fits the room and decor perfectly. It was truly made for this space." "I found the customer service to be great and overall had a wonderful experience. I love my table! I was surprised by the high quality of the table especially for such a great price. I would definitely recommend this company and their products to my friends." "Vision Billiards is the best! Rustic table design, service, flexible payment plan, table set up is all good. The owner, Vidmas is the best to deal with. Couldn't be happier!" Please feel free to get in touch with us if you have any questions or would like to place an order.